Bright Angel Farm is home to four horses, Leo and J-J, the bunnies, many happy chickens and a few kitties. Bright Angel Farm welcomes families from near and far. Plan to spend as much time as your schedule allows introducing your children to farm life. Depending on the day, they may be able to help groom the horses or even sit on them and go for a little ride. Please call ahead to arrange for grooming and riding. ​We have many cherry trees, table grapes and wine grapes. We cultivate all our plants as naturally as possible. Each year we open the orchard to allow anyone to come and pick their own tree or vine ripened fruit at minimal cost. Typically, the picking season starts in late June or early July and continues through until early September. 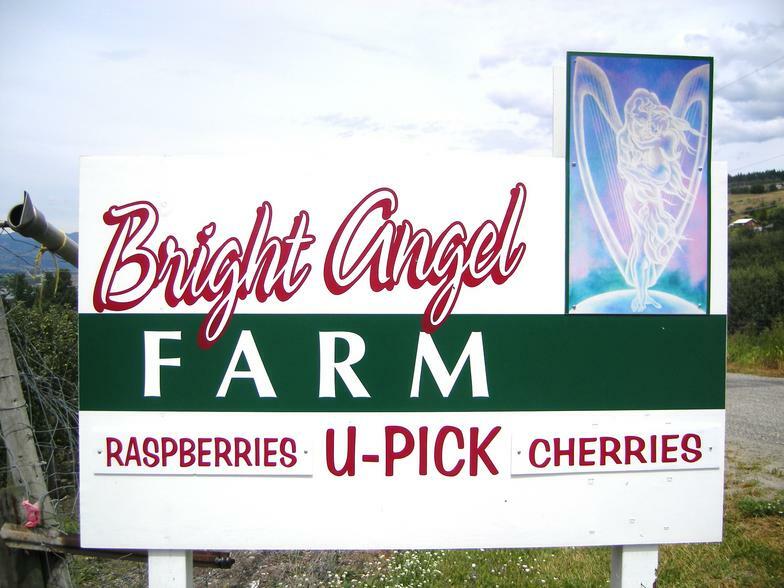 Bright Angel Farm is located on a gently sloping hillside overlooking Swan Lake, at the north end of Vernon in the Okanagan Valley, BC. The Farm is our cherished home, where we live with our children and our other 'family', our many farmyard and household pets. 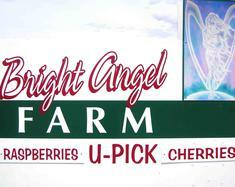 Bright Angel Farm is set on 4 incredibly fertile acres where we have planted and nurtured a wonderful orchard. Each summer we invite everyone to join us to share in its abundance. 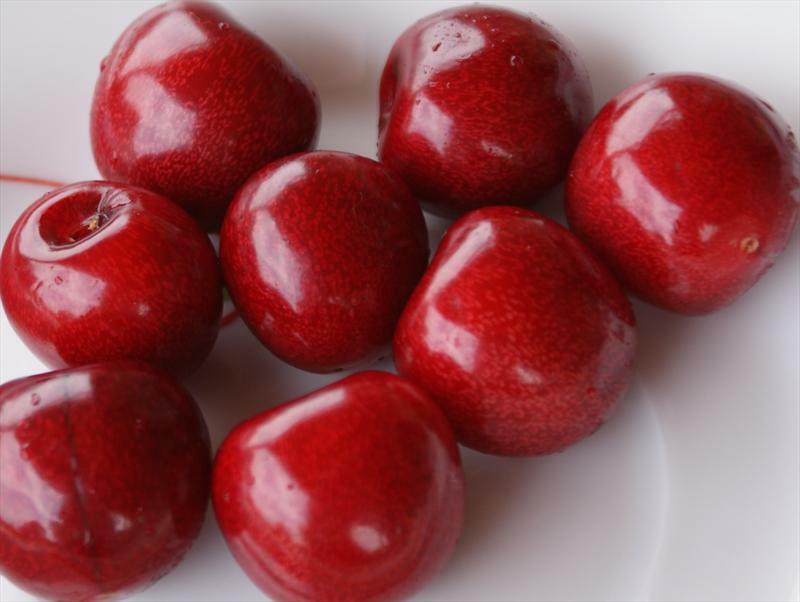 This is a variety of sweet cherry characterized by dark ruby skin, deep red flesh, and are a very large size. These make a delicious sweet cherry jam or jelly! Lapin cherries are one of the most popular fruits commercially grown around the world, and this variety tends to keep better than other types of cherries. Lapins are generally ready to pick in earlyJuly and can keep ripening all the way to mid August. Bright Angel Farm has many cherry trees, offering varieties such as Lapins, Lamberts, Stellas, Rainiers, Sweethearts and sour pie cherries. 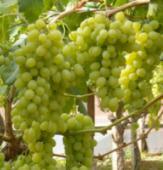 We also produce table grapes and wine grapes. Lambert are one of the main types of cherries grown in the Okanagan. The fruit is large, round and a beautiful deep ruby red color, and has a semi sweet flavor. Lambert cherries are usually available around the middle of July. Lamberts are excellent for out-of-hand eating as well as cooking and baking. Thinking about a rich chocolate cherry cake for your next summer dessert? Lamberts are an excellent choice! Stella Cherries are the fattest, blackest, crispest, juiciest cherries you'll ever taste!  They are a large fruit size and the trees have a high yield. 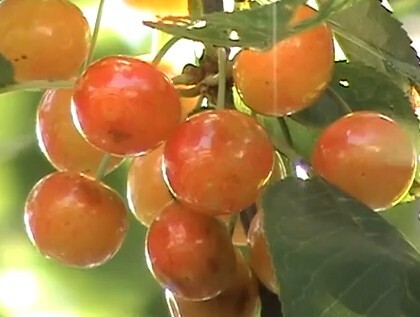 The Stella variety was the first self-fertile cherry developed at the Summerland Research Station in the Okanagan Valley. Stella fruit has sweet, juicy flesh and rich flavor. Sweetheart cherries are a late ripening variety. They have a unique taste and a firm fruit that is crunchy when picked and eaten fresh. Sweetheart cherries are usually available in late July to the middle of August. Sweetheart's are very good in a cherry dessert, canned cherries, and sweet cherry jam. The Sweetheart cherry is also a good type of cherry to ship, so if you're looking to take cherries home with you, these keep fairly well. Sour Pie or Tart cherries are light to dark red and are best known as the key ingredient in desserts. They are also delicious in main courses, salads, jams and jellies, and beverages. Sour Pie cherries are seldom sold fresh in your local grocery store. They are harvested in July and usually frozen, canned, or dried for use throughout the year. You'll need to come to Bright Angel Farm to pick them fresh. Table grapes are intended for consumption while they are fresh, as opposed to grapes grown for wine production, juice production, or for drying into raisins. 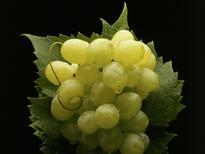 Table grapes tend to have large, seedless fruit with relatively thin skin. Table varieties usually have lower sugar content than wine grapes and are more flavourful when eaten. Their flavors, however, do not survive fermentation and their low sugar content means that any wine produced from them is weak, bland-tasting and easy to deteriorate. Table grapes usually have a sugar content around 15% by weight, compared to the wine grapes which are harvested at about 24% sugar content. The Table grapes at Bright Angel Farm are typically ready for picking in late August or early September. Look for cherries that are firm to touch, and are without bruising or soft spots. Try to pick cherries with the stems on. The skins should be smooth, and free of tears, white spots or blemishes. Cherries damaged by heavy rain or hail may have cracks in the skin and should be avoided. Store cherries in the refrigerator to keep them cold. They will last for up to a week. Cherries ripen quickly and should be used as soon as possible upon ripening. Avoid storing cherries near strong-smelling foods. Avoid washing cherries until you are ready to use them. Remove mushy or rotten cherries from the bag or box in order to preserve the rest. Avoid placing cherries in direct sunlight, such as near windows, to prevent deterioration of the fruit. You can freeze most types of cherries by first rinsing and draining them thoroughly. Freeze individually first on a cookie sheet in the freezer overnight. Once the cherries are frozen, transfer them to a heavy freezer bag. Frozen cherries can be kept up to a year. The typical picking season for cherries begins in early July and lasts for 2-3 weeks depending on the weather and the number of people picking. ​Table grapes are ready in late August. Please call or email to arrange a picking time.